Home » Play » Tour the town with Cars! 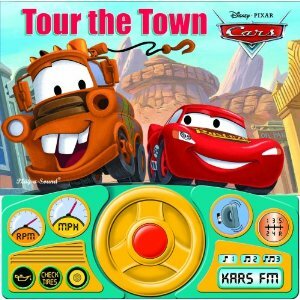 Tour the town with Cars! Mystery solved! For weeks, Little Man has been making “Nnroooommmm, Nnrooooommm! !” sounds whenever he pretends to drive a car. It’s been a source of great amusement to Charlie, because I’m the only one in our family who drives, and therefore the only one Little Man is ever in the car with. So Charlie’s been teasing me that I’ve clearly been driving like a race car driver, or a lunatic boy racer – otherwise where else would Little Man have learned to spin the wheel from side to side making screeching sounds for effect?! I was beginning to wonder if it was true, when I picked up a book from the bookshelf for Little Man’s bedtime story and the penny dropped. It’s this book: Disney Pixar Cars Tour the Town (Steering Wheel Sound) Note “steering wheel sound” in the title. This book comes complete with a steering wheel and driver’s dash. When you first get the book, you need to pull the steering wheel up, and it pops into place, ready for action. While you read the story to your little one, he or she can spin the wheel – with screeching vrooming sound effects – and if that’s not enough, there’s a whole panel of other sound effects, including dripping oil changes, three different radio channels, and revving gear changes. In theory, while you read the story, whenever you come across an icon representing one of the sound effects, your little one should press the appropriate button to hear that sound. Little Man doesn’t get that yet! But he enjoys pressing the buttons at random to add a cacaophony of sounds to our story time. Right now, I feel that the book and the story are a bit long for Little Man. He’s usually busy turning to the next page, when I’m only halfway through the paragraph on the current page. But he certainly loves turning the steering wheel and pretending to drive through all of the scenes in the book! Vrroooom Vroooom!